Add our Shop to your Favorites and receive our email newsletters about new items and special promotions. 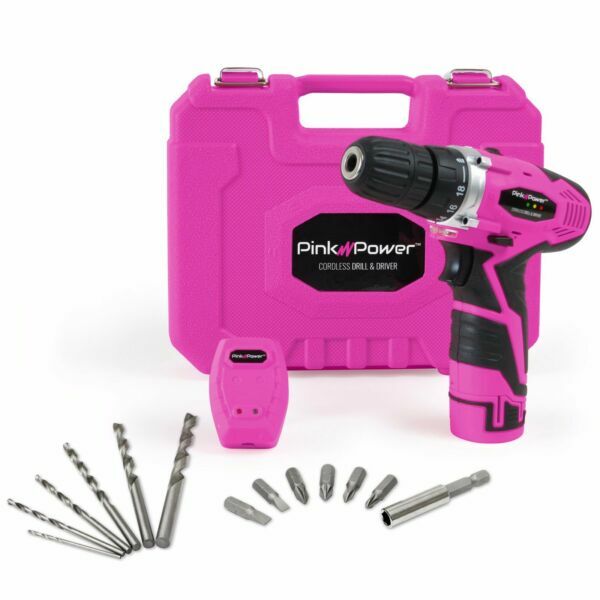 The Pink Power PP121LI 12 Volt Cordless Drill and Driver Tool Kit for Women delivers on both performance and looks. With its light weight design and eye popping color, this is an electric drill you can take anywhere and use to accomplish any home improvement project. With 18+1 torque settings, this drill gives you the precision you need for any project. The 12V powered, high capacity motor is capable of two speed settings (0-350 RPM in the low speed setting and 0-1250 RPM in the high-speed setting) to help with a wide variety of drilling and fastening applications. The PP121LI was designed to be a lightweight, user friendly power tool that is still strong enough to handle wood or metal drilling. It offers a 3/8” keyless chuck allowing users to change bits without the need of a key. Its variable speed can also be adjusted by the amount of trigger depression and the direction of rotation is easily changed by a small switch trigger in the center of the drill handle. ALL INCLUSIVE DRILL SET: Tool kit includes (1) 12 volt drill, (1) tool case, (1) charger, (1) 12V Lithium-Ion battery, a drill bit set, and a one-year warranty. BUILT-IN LED LIGHT FOR DARK WORKSPACES: Compact cordless drill includes a built in LED light that activates when triggering the drill, making it easier to work in tight or dark spaces. LIGHTWEIGHT WITH SOFT GRIP HANDLE: Weighs just over 2lbs with the battery making it easy for anyone to use for long periods of time. The perfect addition to any hand tool set. BATTERY GAUGE SHOWS REMAINING POWER LEVEL: The built-in battery power gauge shows how much power you have left. The cordless, battery powered design allows you to work anywhere. OFFERS KEYLESS CHUCK AND TWO SPEED SETTINGS: Each PP121LI drill offers a 3/8” keyless chuck to help make changing drill bits easy. With 18 torque settings and a drilling feature, plus two speed settings, this cordless drill will give you the precision you need to tackle any project. We accept Paypal and all major credit cards through Paypal. Other payment methods available on select orders. All of our items ship Monday through Friday and go out within 24 hours excluding weekends. Shipping is always FREE to the 48 contiguous US states (and sometimes Alaska, Hawaii, & PR!). Most of our items can be shipped to PO boxes. Please contact us if you need your item shipped to a PO Box. We are required to collect sales tax for all orders shipped to a FL address. For international customers average delivery time is 7-11 business days but can take up to 6 weeks depending on the shipping method selected. Please note items may sit in customs for additional days. Buyers are responsible for all duties, taxes and brokerage fees. Please check the Shipping and Payments tab at the top of the page for international shipping rates or contact us for a quote using the Ask a Question link at the bottom of this page. Sorry we cannot send items as gifts or decrease the values. We accept returns within 30 days of receipt. All items must be unopened and include original packaging. Buyer is responsible for shipping. There is a 15% restocking fee for all returns that are not defective or damaged items. All returns must receive an RMA number before return shipment. If the item arrives damaged or defective we will take care of all return costs and send a replacement or offer a full refund. Here at Popwaves we offer awesome deals at some of the lowest prices in the world! We take pride in our customer service and fast shipping. We started our Ebay business in December of 2011 and currently employ 10 people in the beautiful city of Tampa, FL. We list our phone number in every Ebay listing so our customers can get their questions answered right away. We currently donate to several charities. Just check our Donation Deals to view the items we like to donate on! Thank you for choosing to do business with us. We are open Monday thru Friday from 7am - 4pm (EST). All emails and messages are answered within 48 hours. You can also call in to speak with a customer service representative during business hours. All messages left outside business hours will be replied to the next business day. To contact us, please reach out to us through the eBay messaging system.